Windows 8.1 is officially set to be released on October but now it has reached the RTM stage. Yesterday saw the first leak of Windows 8.1 RTM in English language and now it seems to be very popular and it is downloaded by many users. Microsoft recommends to not use the leaked version but they are not going to release it for developers now as they did with every Windows version before. So developers are more likely to get hands on the leaks as soon as possible. One more thing that creates sense is that the RTM version can be activated with your genuine Windows 8 key which means you can use the operating system without any problems with Windows 8 key forever.Microsoft won’t support Windows 8.1 RTM as of now as it’s yet to be released officially in mid October. Windows 8.1 RTM which was released a few days ago has leaked to the web as Microsoft denied to release the RTM version for IT and developer before October.Microsoft are really struggling hard to stop leaks but alas, it is rounding the web now. I can't give the direct link to the download but I can say that most of the file hosting and torrents are having Windows 8.1 RTM ready for download. Developers are likely to get hold of this version as soon as possible because they want to test their apps in the final version of Windows 8.1. Microsoft recommends developers to use the preview version of Windows 8.1 to test and develop their apps.Developers who use MSDN and TechNet used to get the RTM version of Windows before the general availability which helped them to deliver stable apps at the official launch but with Windows 8.1, the game has changed a lot. They won't get the RTM version earlier instead they will have to wait for the official release of the OS. Microsoft on other hand are trying to convince the developers to use Windows 8.1 preview to develop and test their apps for Windows 8.1.They say that there won't be much changes done to the code which will keep their app running fine in Windows 8.1 RTM. Users state that they are loosing stability of the OS as it's in the preview stage. Of course, the RTM version will provide more stability and performance improvements over the preview version. Microsoft announced that they won't release Windows 8.1 RTM for MSDN and TechNet users due to privacy problems. MSDN nd TechNet users are raged because they used get the RTM version of Windows before the general availability so that they can test and develop apps in the stable environment of the OS and release it with Windows when it releases to the general masses.Check the comments section of this post to see how frustrated are the users of MSDN and TechNet.Here are some of the comments made by different users. "Microsoft's decision to withold Windows 8.1 RTM to developers and volume licence customers is a significant mistake. It further discourages developers and enterprises to adopt it's new operating system by introducing unnecessary delays and roadblocks to readiness activities. It really defies logic. " "So developers are supposed to spend their time developing in the 8.1 Preview, and then do it all over again when the final release hits the streets? If the final 8.1 version is ready enough for hardware vendors, it is damn sure ready enough for app developers. What is the point of paying big money for MSDN when anyone off the street will get it the same day?" Opera is working hard adding new features in every major release since it changed to the WebKit engine. Opera 16 brought many new features to the browser and one of the most needed feature is auto-fill forms feature which is avaiable in Chrome. It looks that Opera are making some progress in improving their browser.So grab the newest version of Opera for new features. Windows 8.1 is set to be released on October 17th via the store for all Windows 8 users as free update. Let's get to know what will happen to our files,apps and settings when we upgrade to Windows 8.1 from Windows 8. The first and easiest way is upgrading the OS using Windows store.It will download a big file around 1.5 GB ( may be higher for x64 version ). It is the best and easiest way to upgrade to Windows 8.1.It will keep your computer's files and apps at their places. After a long wait, here we are at the launch of Windows 8.1 RTM to OEM’s who will come up with new Windows 8.1 devices in October 18th.Windows 8 users can now be happy because Windows 8.1 brings in a lot of features which was badly missed in Windows 8.You can read more about this in the lengthy blog post. Opera have managed to update their new WebKit based browser to version 16 which brings better performance, and geolocation + autofill forms.It is set to be released today officially.You have to do nothing as the WebKit based web browser silently updates itself to the new version as soon as it is available. 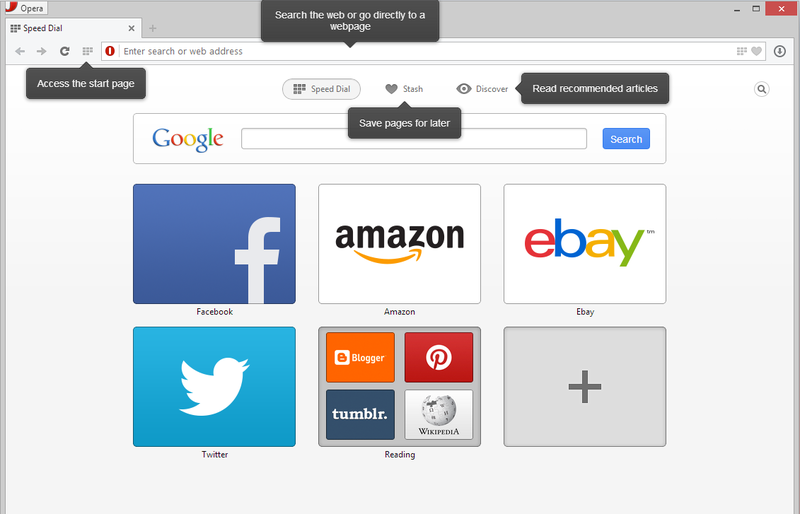 Opera after making switch to WebKit are trying hard to add the old features and some new ones to the browsers. Windows 8.1 is all set to be released on October 17th to Windows 8 users and others on October 18th. Microsoft is reportedly developing the next major versions of Windows namely Windows 9 and Windows 10 ! Windows 10 looks a bit more advanced and innovative with cloud as a major feature of this OS.Microsoft are clear to take the OS to the cloud and make it available to any devices at any time.This will become the first cloud based OS in world. Take everything with a pinch of salt as everything are rumors from the people who are closely connected to Microsoft. The popular system cleaner has been updated to version 4.0.5. It brings support to newer browsers and there are bugs fixed in the latest version.It is recommended to grab the latest version as soon as possible . It also adds support to Windows server R2 preview. Windows defender is not good enough for protection,you can get some other antivirus even for free ! Windows defender, in spite of getting many improvements in Windows 8 is not enough to protect your computer completely. 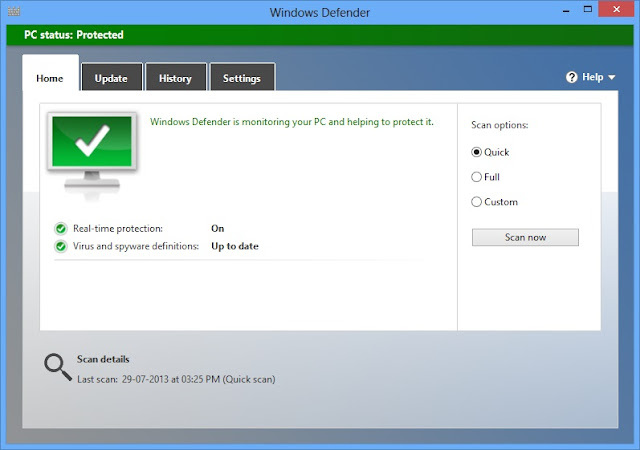 Windows defender is the in-built security solution for Windows 8 and it is also available for Windows XP,Vista and 7 users as standalone product called Microsoft security essentials.They both are nearly same in most ways and share the same definitions. AV-test released a report in which they tested several popular security suites.Bitdefender,Kaspersky and Norton shared the top three spots respectively.F-Secure, GData and Avast shared the fourth place, with the Avast suite achieving the honour of being the best free protection package tested.But Windows defender disappointed a lot.It could just protect you from 79% of realtime threats while the top four managed to give protection rates ranging from 98% to 100%.Windows defender showed poor protection rates than any other antivirus program available. So,I recommend all the users to better use any one of the top solutions.If you don’t want to shell out money for antivirus then consider avast! free antivirus or AVG free antivirus which provides excellent protection against threats for free. Windows 8.1 has been making a lot of buzz in the tech world as it re-imagines the way Windows 8 works.It tries to meld the touch and Desktop environment tightly and easy to use.It makes users familiar with Windows 8.Microsoft said that the RTM version of Windows 8.1 will be released to OEM’s this month and it will be available to all users on October 18 while Windows 8 users can get it from the store a day earlier. The latest leaked build 9477 seems very close to the RTM flavor of the update but it has some bugs which are being fixed internally within Microsoft and it’s partners.Most probably they will release RTM version next week to OEM’s.Microsoft is going to improve and update the RTM version several times before it hits to the general mass. They are trying to keep it solid and stable when it becomes available to all users. 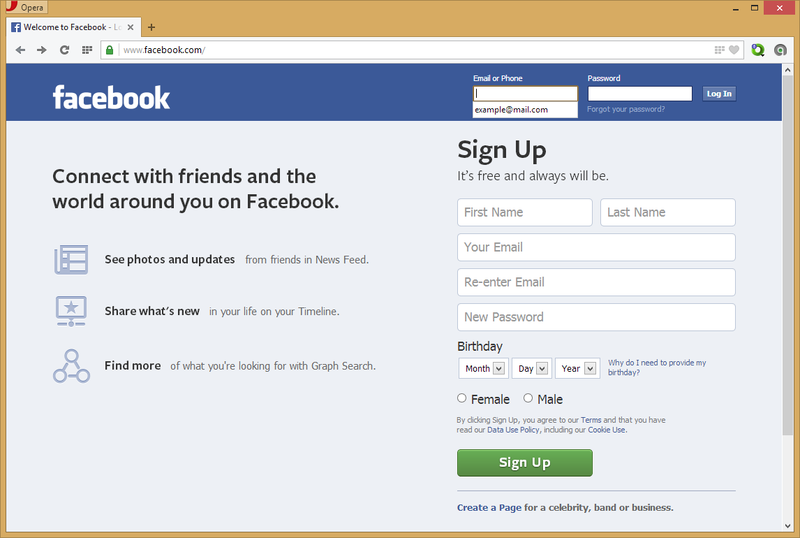 Chrome 29 brings in some new features and changes for the omnibox. 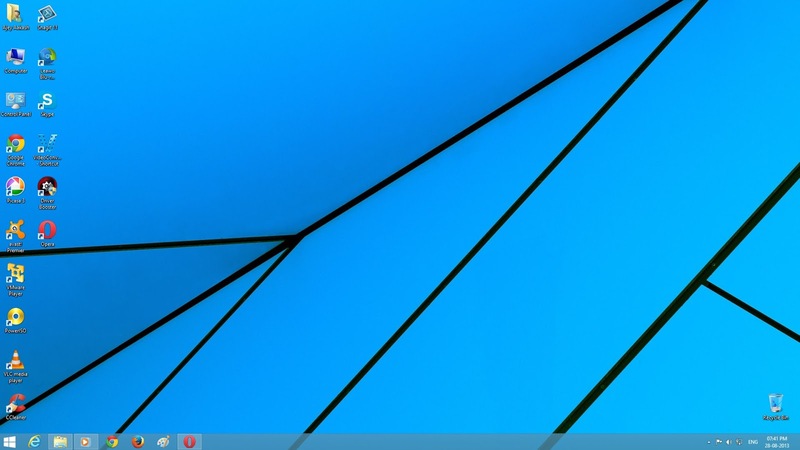 Windows 8 removed the aero effects completely but the aero effect is still present in the taskbar. 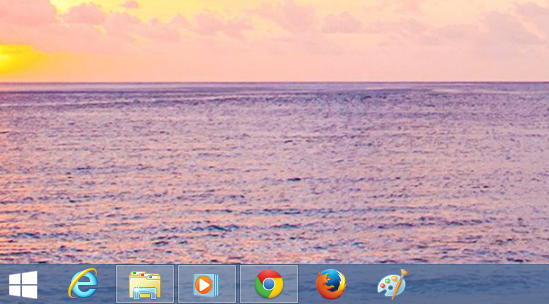 It looks very odd to see aero only in taskbar. So here is a simple way to remove the aero effect using Start8. If you have Start8 installed then you can use it but if you don't have it . I recommend to download from here or other wise you can also use Classic shell to remove the transparency .I will use Start8 in this post. Open your Start8 settings and go to Desktop tab. Check Disable taskbar translucency option. You have done it. Now your taskbar won’t show the aero effect and it will be opaque . avast! has released their next generation set of antivirus programs including the free antivirus which is one of the best available in the market. It now sports a new brand new interface which looks like the modern Windows 8 style and there are a bunch of improvements found in the new update. If you have been browsing the web for last few years then you will know about Google Chrome.Google Chrome is a simple,fast,secure and modern browser which was released in late 2008 by Google. Google Chrome now has millions of users worldwide.It is one of the most successful browser which is known well for it’s speed and simplicity.But how did Chrome achieve this place within a short span of time ? Chrome was the first browser which was developed with simplicity and speed in mind.Users don’t have to be a computer geek to use the browser. People who did not know computer well would go for this browser as it provides a faster and safer web experience under a simple user interface.People never saw any browser to be this simpler at that time when Firefox and Internet explorer was ruling.Google knew what was needed in basic browser for an user and created Chrome. It brought several revolutionary changes to the browsers world.It made it simpler and faster.Chrome gets updated with new features every six weeks.Browsers have evolved so much using the idea given by Chrome which is an perfect example how a modern browser should be. It avoided the trouble some toolbars and created a small place for the extensions in the corner which was still powerful and productive without cluttering the browser.Every change was accepted by most of the users.This made other browsers to change themselves. Internet explorer,Firefox and Opera improved their interfaces following the likes of chrome.They are now modern and they provide better web experience and Google Chrome remains as indirect reason for this.Chrome is getting better and better and similarly Firefox,Internet explorer and Opera are also innovating new things.But in every way,the web is moving forward. Computer gets slow and slow when you install apps. Sometimes it becomes very slow that you would be amazed how your computer so slow.One major reason is fragmentation of your hard disk which happens when you install and uninstall apps.You can avoid this by defragmenting your hard disk regularly. 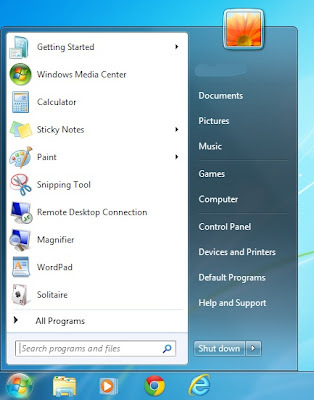 If you are using Windows 7 or Windows 8 then you are in luck because Windows has defragmentation tool which automatically defrags your computer on regular basis.In Windows 7, you can go to start menu and type defragment and optimize drives.In Windows 8, you can go to start screen and type defragment and optimize drives and open it. But if you are using Windows XP or Windows vista which has a similar tool but it does not defragment your hard disk regularly.So I recommend IObit Smart Defrag which is a small and free software to do this job for you automatically. Defrag your computer and keep it stable and fast! Google made it's own engine for it's browser called Blink and this engine was implemented from Chrome 28 which replaced WebKit . Blink is a engine which is a sorted out version of WebKit. This engine does not bring any big changes to the users but it has improved the browser in the background.Chrome remains the same in all function and every feature you found in Chrome 27 is there.Chrome extensions run smoothly .Only thing I can find is the improved speed of the browser and powerful support to HTML5 . Do you notice any changes ? Firefox,Internet explorer and Opera have this awesome feature.But Google chrome has it but it is disabled by default and you can enable it. Open a new tab in Google chrome and type chrome://flags . Then scroll down till you find smooth scrolling or you can search it using ctrl+f. Then click on enable and click on Relaunch now. That’s it. Now your Chrome will smooth scroll like every other browsers. Firefox has been updated to 23.0.1 which fixes some bugs found in the version 23.0.Here is the list of bug fixes. I recommend Firefox users to update their browser for a better and stable web experience. Softpedia has announced a new giveaway for one of the best DVD ripping software which costs around 44$. I recommend you to use this software because it does DVD ripping very well and is one of the best rippers available.Go here and follow the steps given to get it for free. Windows 7 is currently the most popular OS.Windows 8 is a lot secure than Windows 7 because it is a new operating system which came with many new security features in-built such as the new Windows defender. 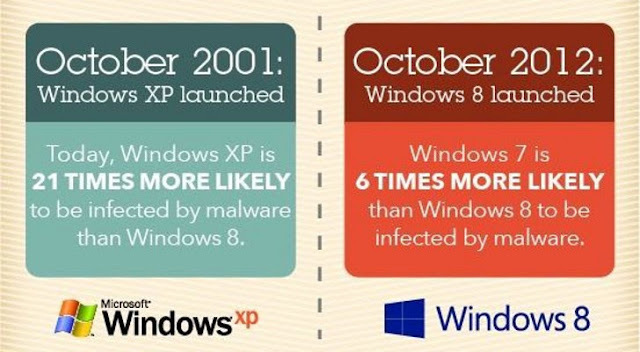 Windows 7 on other hand is more popular which means that many viruses will come out aiming to attack Windows 7 users while the oldest Windows XP is the most vulnerable OS. Windows XP will go out of support next year.Microsoft is trying to move Windows XP users to Windows 7 or Windows 8. You may be wondering how to Rip your favorite movie from the DVD you bought so that you can enjoy the movie without DVD.DVD’s may be scratched and the data in it will also go off and so will you movie if you did not handle it well.DVD’s can’t be used in smartphones,tablets and you want to watch your DVD content in it,then you must Rip it to the supported file format. First download WinX DVD Ripper which is a free video ripper with many features.And install WinX DVD Ripper.You can use it without registration forever. Then insert your DVD into the computer.Open WinX DVD Ripper.Click on Disc in top left corner of the program. A dialog box will appear and ask you to select the DVD drive location in your computer.Select it and click OK. Your DVD will show up as Video File.Now just select the desired file format you want to use.If you are going to use the video in computer then the recommended format is MP4.You can also customize the Audio and Video to your choice but if you are unfamiliar with all this then leave it in it’s default value. Click Start and it will take a while to rip your DVD.After it you will get the video in the format you selected in the previous step. You can also rip your DVD to support different devices such as Apple devices,Samsung,HTC and more.. It’s very simple isn’t it ? 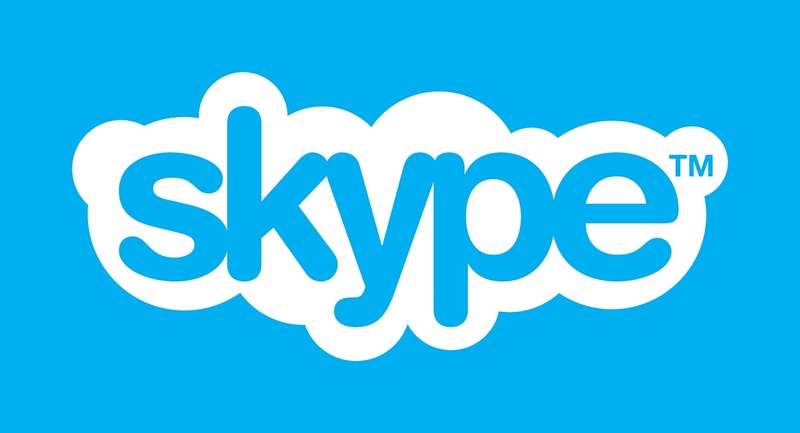 Windows 8.1,a major update for Windows 8 is going to be available to all by October 18.Microsoft is now confirming that Skype will be be the default messaging app for all.Skype is one of the most popular video calling and messaging app which is under the control of Microsoft. It seems they are making Skype an important product in Windows family.Now Skype is available as a separate app for Metro UI from the store and there is also the traditional desktop version.With Skype coming pre-installed with Windows 8.1,you are just clicks away from video calling.You can connect with all the people who use Skype and if someone uses Windows 8.1 then it will become easier to connect.Skype is deeply integrates with Windows 8.1. Do you think this is a good move by Microsoft ? Do you use Skype ? Internet explorer is now 18 years old ! Internet explorer 1.0 was released on 16 August 1995 with Windows 95.Later it went through several changes and new versions came almost with every new Windows release.Till IE 6 ( XP – 2001) there was no tabbed browsing feature but IE 7(2007) which came with Windows vista brought numerous improvements to the browser with improved speed and new features.IE 8(2009) came with Windows 7 which followed the design of IE 7 with improvements. But the biggest change with IE 9(2011) which made IE a modern browser which was followed by IE 10 (2012) in Windows 8 which has a powerful desktop version and the touch powered Windows 8 UI version which lets you to touch the web. Available in regions with Xbox Movies Store. To see which features are available in your region, go to the Xbox Video feature list at http://support.xbox.com/apps/windows-8/xbox-on-windows-features. The interface has some changes,the background is now in black color.I recommend you to grab this update as soon as possible via the store . Is Windows 8.1 really needed ? The direct answer is a big YES but some users like me feel comfortable with Windows 8 and some are not feeling the same.For diehard Windows users,Windows 8 brought a complete change over the functionality of the OS.I like all of the changes and some fans needed some changes to the OS, they wanted start menu and a lot of things back at the place. Windows 8.1 brings a lot features to enterprise users too such as the boot to desktop directly option.Biometrics is also supported by the OS without the need of third party programs.You can read about the enterprise features from here.It brings a lot of changes to the desktop as well such as the new updated file explorer.It brings new and updated apps for doing common tasks easily such as alarm,reading list and more.IE 11 also comes with new features for touch and adds WebGL support. Windows 8 was a bold departure from the traditional Windows and many people did not like it much but Windows 8.1 is built with all the feedbacks that Microsoft got with Windows 8. Getting new features without waiting for years, with Windows 8.1 Microsoft is removing the need of service packs.It’s free and it’s made for you.Grab it when it becomes available via the store. Mozilla is already testing the Modern UI of Firefox and now they have planned to release the Modern UI version of Firefox with the 26th version of the browser.Currently,Internet explorer is the king of touch based Modern UI and Chrome has an option which will make Chrome run in Modern UI but it does not support touch gestures. Firefox will be available in both desktop and Modern UI version.It will be available in the December of this year.Let’s wait and see what the new Firefox is up to. At last Microsoft has announced the official date for the general availability of the first major update for Windows 8. ”I know a lot of folks are eager find out when they will be able to get Windows 8.1. 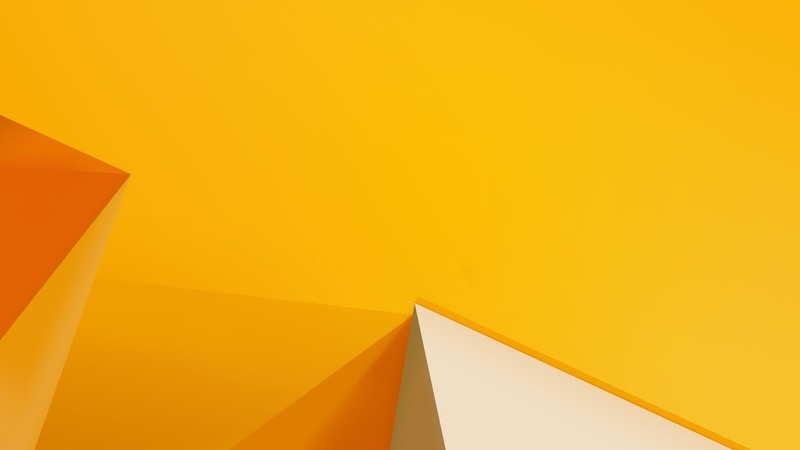 I am excited to share that starting at 12:00am on October to18th in New Zealand (that’s 4:00am October 17th in Redmond), Windows 8.1 will begin rolling out worldwide as a free update for consumers on Windows 8 through the Windows Store,” Brandon LeBlanc says. Windows 8.1 brings in a lot of changes and new features to Windows 8. 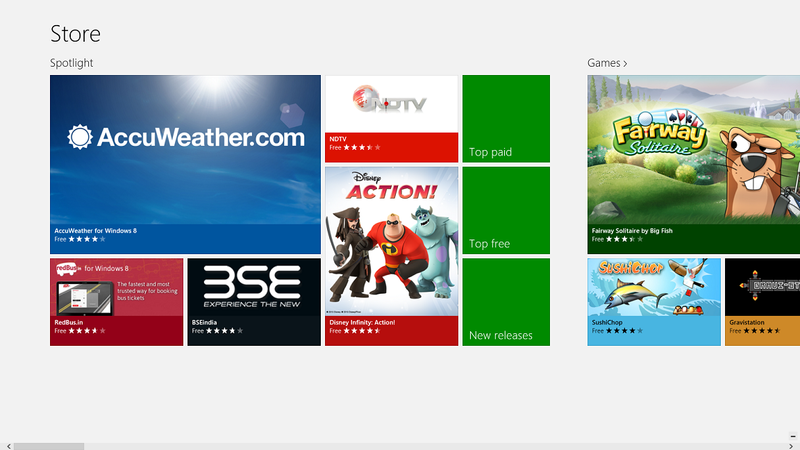 I recommend every Windows 8 users to upgrade to it via the store when it is available. If you are a regular visitor to my blog then you might have noticed a big change in terms of design. I have made these changes hoping for a better and smoother experience in this blog. The left side shows the old design and right side shows the current design. I have removed the orange effect from my blog and now it sports a minimalistic blue,black and grey color. The colors make my blog look clean and better for reader. I have taken some of my precious time designing it and each and everything is customized and made to look to simpler. I have created the background images and header image myself.You can also see similar changes in my friend’s blog Gadget Access which is also done by me using my friend’s choice of color (green). Which one do you like the most ? I love hearing from my readers, if you have any suggestion then kindly comment it under the post. I just installed Windows live writer and set it up for my blog.This software works like a charm and I really like ability to choose my favorite font,Segoe UI. It provides me a clear Window with the theme of my blog behind which makes me feel at home and I can straight away click on preview which is in the bottom left corner to view the preview instantaneously.It has a spell checker built in too. I can edit the images by adding some effects to it like reflection and also I can add a watermark with a click.I have added a watermark to the image above.I can even add emoticons to my blog . Yesterday was the patch Tuesday for Microsoft products.Windows and Internet explorer was patched against several security holes. 23 different security holes were patched in Windows XP to 8 and IE 6 to IE 10. I recommend that you grab the updates as soon as possible and keep your computer.If you are using Windows XP, then you must install all the updates to stay secure from the security holes. Animated start screen back grounds are here and the new help tutorial in modern UI is also cool.All Microsoft apps are updated and more powerful.IE 11 is in place. Here is an dashing red flowers theme for Windows 7 and Windows 8 users.This theme contains 6 beautiful HD (1980x1080) wallpapers of red flowers.Hope you like this theme. Note: The wallpapers are collected from the internet and not copyright intended ! Microsoft keeps improving the start screen and it is time to see a website which looks like the start screen found in Windows 8. 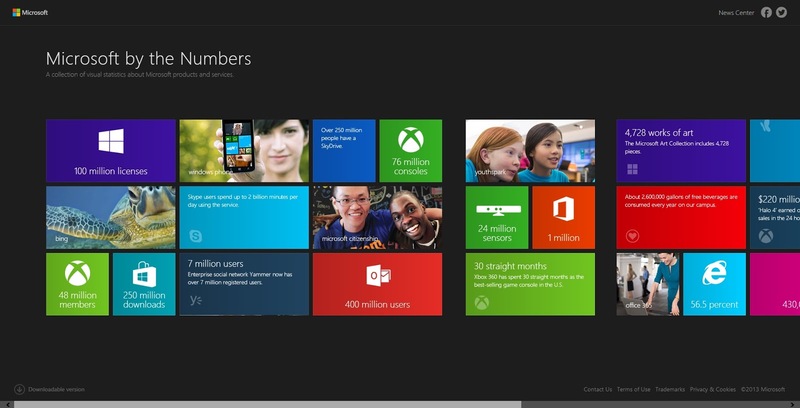 Have a look at this website which provides stats of the latest and greatest products from Microsoft. The website looks cool and awesome. 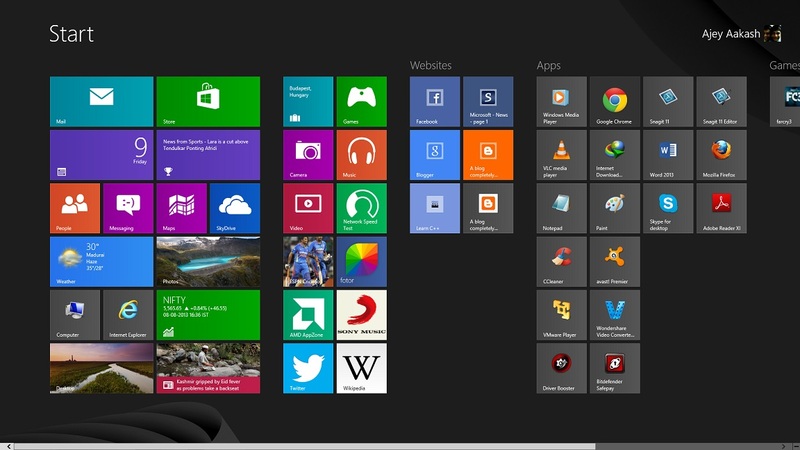 This website also provides live tiles which shows relevant data of the software. 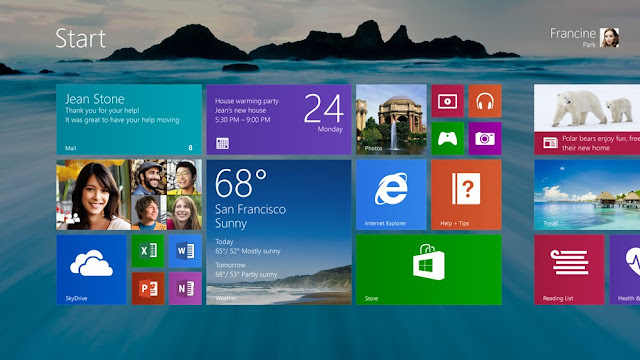 Windows 8.1 is just around the corner and it brings many new features and Start button is the most anticipated feature. The updated build brings Sign out feature to Start button which was exclusively available at Modern UI only.You can also shutdown and restart your computer from the start button too.Also the boot to desktop directly is there and you can now be more familiar with Windows 8.It's more easier to use now . It's hard question because both of them are really fast and modern.Chrome has surpassed Internet explorer in the past but now Internet explorer is fast and solid choice.With Internet explorer 10,Microsoft brought the touch as a serious feature which works awesome when you use it.Chrome on the other hand is constantly improving in terms of speed and web standards. Let me talk about Internet explorer which is the best option if you have touch.It comes installed and you don't have to wait for the installation process.It is really fast and compatible with the web. You would love browsing with it in touch.The Desktop version shares the same engine but it does not work well with the touch but works like a charm with mouse and keyboard. 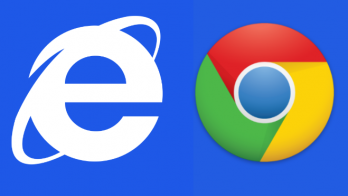 Chrome is always faster and better than Internet explorer but it does not support any touch gestures but it can run in modern UI mode and it does have the capability to pin the sites to your start screen as IE does.It is more standard compliant than IE.If you use keyboard and mouse then Chrome is going to be the best choice for you. Conclusion is that if you are going to use touch as input method then Internet explorer 10 is the best option for you and if you are going to use the traditional mouse and keyboard then Chrome is there for you always. Is the removal Start in Windows 8 is bad ? For a second you will say yes but when you see the start screen and get used to it, you won't say it. 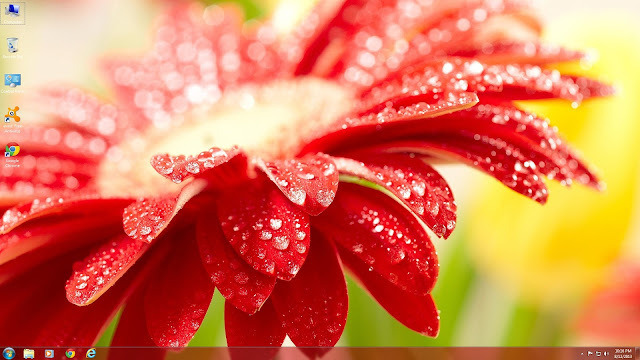 Windows 8 removed the start menu but it replaced it with something better, I can say. Start screen in Windows 8! Windows 7 did a awesome job with everything placed in proper places and it is still a great choice for users.But Windows 8 did something more innovative and great.It brought the new start screen with it's own benefits.Windows 8 can be tapped with your finger or clicked with your mouse.Everything works ! Removal of the the start menu was a big thing for Windows users who have accustomed to it for more than a decade.But it takes minutes to forget the need of start menu.Hot corners provides a cool way to navigate.The start screen itself is vivid and colorful place to start with.You can pin anything and everything here.You can re-arrange them.Name them and hold them in as a category or you can just go to all apps view to see all the apps you have installed. You can use the store to get apps which make your computer productive.The live tiles provide you with real-time updates which is a great way to keep yourself updated without opening the app itself.You can use multiple apps simultaneously using the snap.You can enjoy the apps in fullscreen which means you can concentrate on the app more. Windows 8.1 improves the start screen ! With Windows 8.1 coming this month,things will get better and easier.Users can learn the new way to use Windows which takes just 10-15 minutes and after that you will enjoy it.If you got a tablet with Windows 8,then you are in luck because your tablet is more powerful than ever with Windows 8 running in it.